Following World War II, Japanese animation developed into a new medium of expression that had a powerful impact on various industries and even other cultures. However, it has been noted that in spite of the growing interest in Japanese animation both domestically and abroad, the societal transitions that form the backdrop to their production get very little attention. As a result, even when Japanese animation works achieve great success or even get awards, there there is little chance to analyze and evaluate them in their proper historical and cultural context. 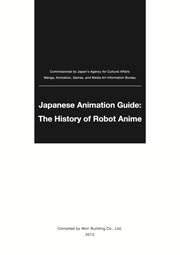 In order to further promote Japanese animation culture, we prepared and released a Japanese-language research report on the topic of robot animation in August of 2013. This research is intended to help categorize the cultural history of the medium, including both the socio-political backdrop and various cultural elements affecting Japanese animation as a whole. It is our hope that this report helps to promote knowledge and analysis of the cultural aspects of Japanese animation. In order to make it more widely available throughout the world, we have prepared an English version of Chapters 1, 2 and 4 of the report. It is available for download below. * Their titles are as of February 2014. 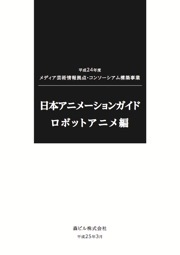 This report shows the result of the Project to Construct a Media Arts Information Base / Consortium in FY2012, implemented by Mori Building Co., Ltd as part of the tasks commissioned by the Agency for Cultural Affairs. It contains works copyrighted by third parties. Please contact the Agency for Cultural Affairs for any requests for reproduction and duplication of such works.